This page illustrates three ways to insert bullet points in Excel. You can use a keyboard shortcut, insert a symbol or create a custom number format. If you have a number pad on the right side of your keyboard, execute step 1 or step 2. 1. To insert a filled round bullet point, press Alt + Numpad 7. 2. To insert a hollow round bullet point, press Alt + Numpad 9. If you don't have a number pad on the right side of your keyboard, execute step 3 and step 4. 3. On the Insert tab, in the Symbols group, click Symbol. 4. 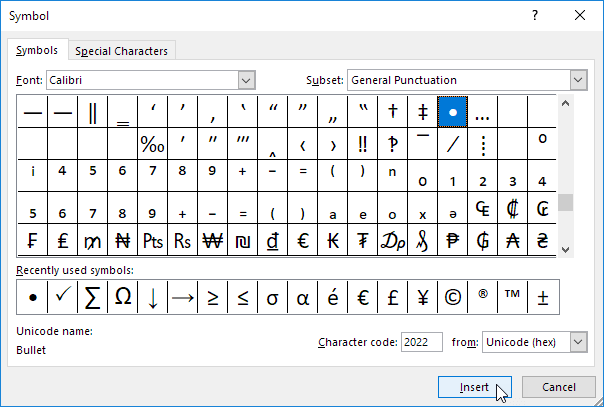 Select a font from the drop-down list, type 2022 in the Character code box and click Insert. 5. 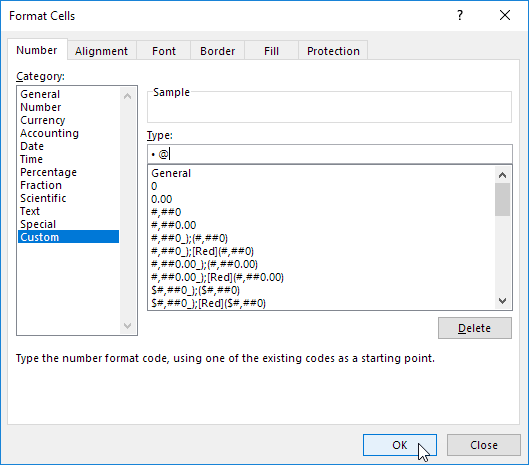 To insert multiple bullet points in a single cell, press Alt + Enter to start a new line in an Excel cell. Create a custom number format and inserting a bulleted list in Excel will be a piece of cake. 6. Select the range A1:A3. 7. Right click, and then click Format Cells. 11. You can now create a bulleted list by simply typing the list items. Excel automatically adds the bullet points! Note: use the Format Painter to quickly copy the bullet point format to other cells.